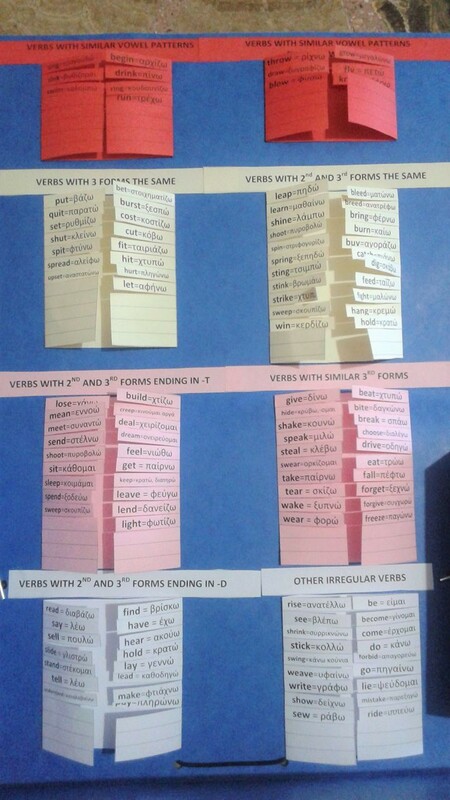 Then, using our course book, my daughter filled in the past tense and past participle forms of the irregular forms while flipping each piece of paper! The categorization of the verbs helped her a lot to first guess the form and then verify it with the help of her course book! Therefore, she said that she studied them while doing the task! When she finished, she decorated the cover of the folder and kept it in her bookcase, saying that she prefers to study them from this lapbook rather than the coursebook! 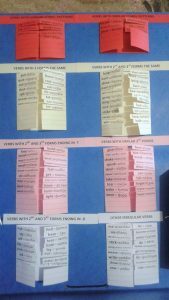 A few months later, she decided that it would be more helpful to stick it on the wall, so that she can refer to it more easily when needed! 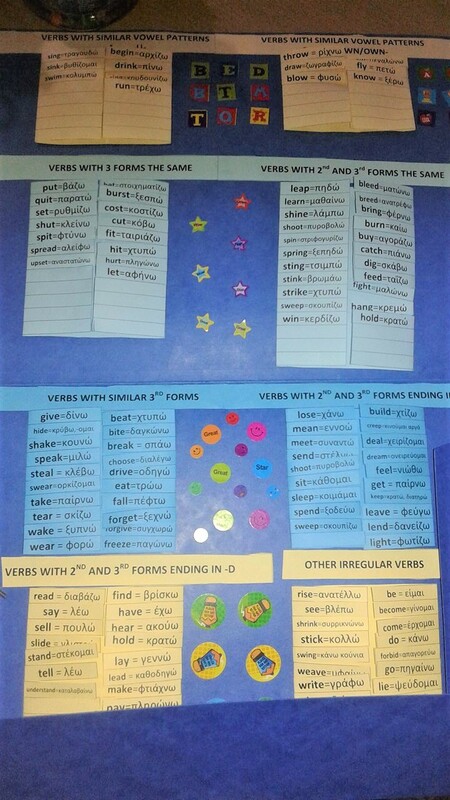 And, in case you wonder, no, she did not memorize everything perfectly in one teaching session, but she liked studying them this way and she does not sigh in despair when we refer to irregular verbs and that is awesome! portray the learner's personal taste, making them thus more attractive to use and objects to take pride in! These are only some of the benefits of lapbooking, as they have been presented in numerous articles and, anyone who regularly uses them, has probably a few more to add! Yes, it took some time to categorize, set up the templates and print everything to be ready for the lesson, but the actual cutting, gluing, filling in of the correct forms and decorating took no longer than a teaching hour that would have probably been even more entertaining and involving if we had the chance to work on it in pairs, or in a group! 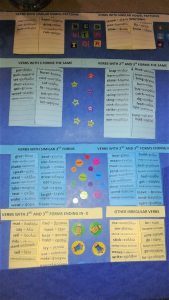 Therefore, this is something that we can probably try with the 5th and 6th grades of the Greek public Primary School, provided that we can obtain the necessary materials and maybe do some cutting on our own, before introducing the activity to our learners, so as to keep it restrained in one teaching session!